Edmonton’s premier business gala brings together our metropolitan region’s dynamic doers, community connectors and industry influencers for a night of celebration and glamour. Relax and enjoy the atmosphere as you toast business success amongst friends and colleagues with a complimentary glass of bubbly. 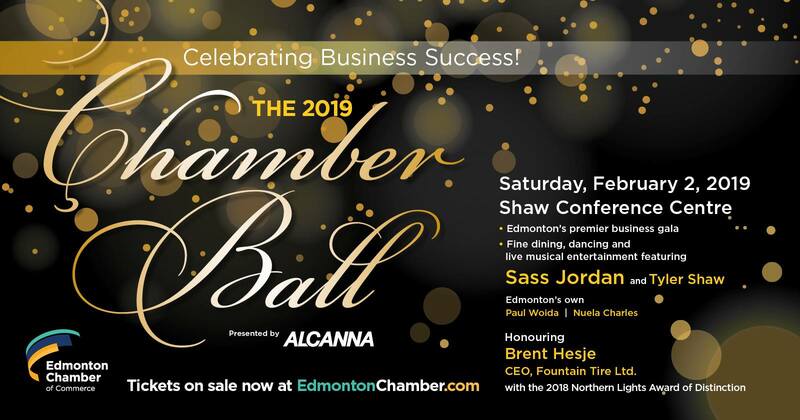 Formal festivities of the event include a transition of the Chair of the Edmonton Chamber Board of Directors, and a celebration of the 2018 recipient of the prestigious Northern Lights Award of Distinction. Enjoy live musical entertainment and dancing throughout the evening as you indulge in an elegant three-course dining experience featuring a menu carefully crafted by our award-winning team of Red Seal chefs. Attendees to the Ball also have access to exclusive guests offers updated here. Time: 5 – 11:30 p.m.